I like being at the edge of the technology in some areas. That started with SuperVHS, and was followed by Laser Disk. I was one of the first in the city to have HD back when that was very new. For some time though, my Apple TV and an HD TV set has been pretty darn good. However lately I have been distracted with people talking about 4K. When Apple started supporting it and I learned the 4K movies would be same price as HD, and any moviees I already owned would be upgraded I thought I should learn more. I learned that as cool as 4K is – I mean twice as many pixels is a good deal, HDR is the real exciting technology. It is what can provide so much more colors. So the combination – I have heard described by others is magic. I heard one guy – who I trust and believe say it was like the first time he saw HD. So I decide it is time for me to move. I confirm that my Netflix is also 4K and HDR but discover that takes 3 CAD additional per month. Ok. I do some research and buy a Sony XBR-49X900E. Actually I meant to buy the 55 inch version but I got distracted. I got it through Amazon for an amazing good price. And they delivered it very nicely too. So when my wife is out I buy and install everything. It works great as an HD set but I cannot get 4K or HDR to work. The internet was not much help and nor was Sony. So that is why I am writing this article. Could not connect it to my Wifi as the onscreen keyboard did not have some of the necessary characters! On the Apple TV I could not get it to go into and stay in HDR mode. Could not power on the TV, or power it off using the Apple TV control. Could not control the volume of the TV using the Apple TV control. What I was seeing was normal HD. I used DeadPool as one example to see if I could see differences. I could not. I should mention that this is an Android TV. So if you have an Android phone it is likely much easier to configure – at least the Wifi. I don’t so it was more work. 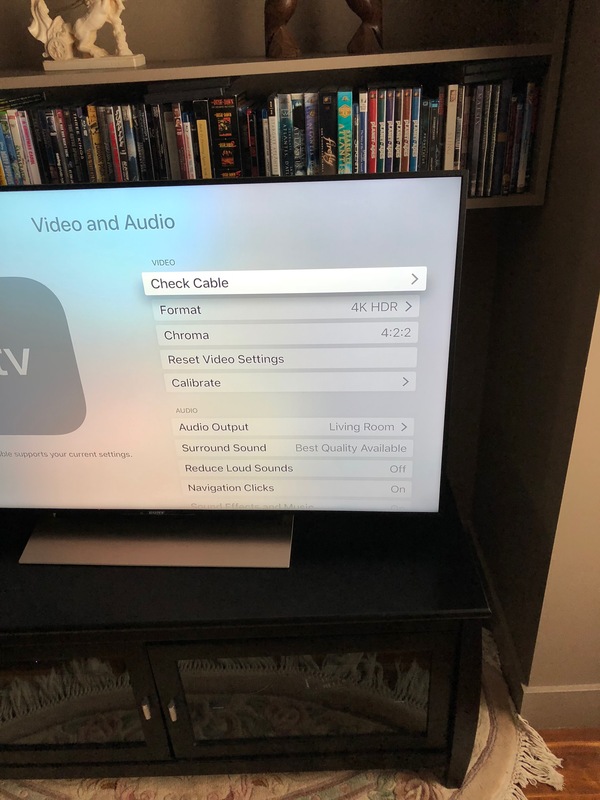 But once it was working, I did not notice that it was an Android TV as I used Apple TV and inside the Apple TV Netflix for all of our watching. I plugged in a keyboard – USB on the left side of the TV – as you face it – and at the top, and the Dell keyboard worked. I used the TV remote to access the gear icon to access Network Expert config (in the TV directory. There is also in the same area a Keyboard option which you can use to confirm your keyboard is seen. In the Network Expert area I was able to use the keyboard to enter my WiFi password. So now connected to the Internet. I did an upgrade of the TV OS but that made no difference. I got nice HD but nothing more. I still could not put the Apple TV into HDR mode. I used the TV HDMI 1 port to connect to the Apple TV and I saw in the reference sheet that came with the TV that HDMI 1 supported HDR mode. But once I was desperate and checking things again and much more carefully I noticed the TV is at 60 Hz and that is not support for HDMI1 but it is for HDMI2. So moved the cable and now I could get into HDR mode in the Apple TV. I could have also changed the 60 Hz to 50 Hz and HDMI 1 would have worked but I wanted to make less changes. I had a Sonos soundbar in front of the TV. I moved it, and that fixed the issue with sound and power on / off with the remote. So now I think I should see and notice 4k HDR content. But I don’t. It all looks the same very nice HD. I notice now on the Apple site that they recommend a very specific cable for this situation. A Belkin High Speed HDMI cable. So I order it. I get the cable and change out the old one for it. I also make another change. I can only make this change if I have a high speed cable – which I now do – and it gets tested – which I know as I tried to do this before I had a high speed cable. Now with the new high speed cable I change my Chroma (in the Video and Audio settings of the Apple TV) to be 4.2.2. This promises better video. But DeadPool looks just as good as it did in HD. The Apple TV menus look just the same as they always do. And I hear that they should look a little nicer. I am told the opening to Jessica Jones and Daredevil look much better in 4K and HDR. Also I should mention that this TV turns on into 4K mode and stays that way. Learn more about Apple TV 4K and HDR – link here – this is a good podcast stream btw. 12/8/17 – I talked to Apple Support, and had them confirm my config and they did. They also looked up the TV and confirmed there was not much in it to hurt me. They also confirmed the HDMI port I was using (2) as the right one. They also said in Netflix there is an HDR Oceans video that shows off HDR really well. The dude also said he didn’t think that most Wifi could do HDR properly. I have been thinking of getting a wired drop behind the TV for a while. So I guess the time is now to do that. Not easy though. 12/7/17 – recently 11.2 dropped with some additional HDR options 0 and I turned both on, but it made no difference to me. Find out more on this release in this article. So I have shown you the problems I had, and the solutions, so the TV and the Apple TV work. But it seems I only get HD. I will talk to Apple next and see what they can do. I will update this article when I learn more. Sorry I don’t yet have all the answers but I wanted to get this out so at least you can get the basics working. As always comments and questions welcome. Also, suggestions too! very interesting read as always! I also have the 4k AppleTV but only HD tv (Philips) yet. I am thinking about buying new tv. I am also desperately waiting for the new Amazon Prime app for AppleTV!